AARHUS SYMPOSIUM FOCUS Aarhus Symposium Focus is an inspiring and enlightening event that takes place on Monday evening in the week of Aarhus Symposium. The purpose of Aarhus Symposium Focus is to engage leaders of today with leaders of tomorrow in a discussion on Denmark’s most important challenges. Before its renaming in 2016, the event was known as Battle of the Economists. 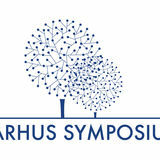 This year, we are looking forward to welcoming you to the very first Aarhus Symposium Focus. Join us on October 31, 2016. HOW WILL WE WORK, AGE, AND LIVE? Is the Danish economy powerless against changing demographics? Denmark is facing the power of demographics. Within the Danish economy, increasing longevity creates major challenges for the welfare system and the labour market. Outside the Danish borders, international demographic changes add further complexity to these issues. 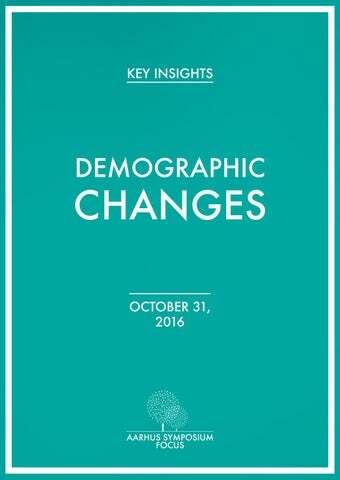 The Danish economy will inevitably have to adapt to these shifts in the demographic composition, but how? must also incorporate demographic shifts on an international level. High labour mobility across borders is central to this discussion, as labour markets are constantly altered by migration patterns. If Danish businesses are able to leverage the high mobility to secure an inflow of skilled labour, this may create new opportunities for growth. However, is the Danish welfare system flexible enough to cope with these structural changes â&#x20AC;&#x201C; or is the power of changing demographics too strong? At Aarhus Symposium Focus 2016, we have invited three speakers within the field to elaborate on these important questions. In an economic discussion, they will elaborate on how we will work, age, and live in the future. We encourage you to join the discussion on October 31, 2016. We are pleased to welcome Allan Lyngsø Madsen, Chief Economist at the Danish Confederation of Trade Unions, LO, to Aarhus Symposium Focus 2016. Allan Lyngsø Madsen’s career started in the Economic Council, whose primary objective is to provide independent analysis and policy advice to Danish policymakers. Allan Lyngsø Madsen’s great interest in providing policymakers with economic counselling has served as a guiding star throughout his career. Before being appointed Chief Economist at LO, Allan Lyngsø Madsen held various positions at The Danish Metalworkers’ Union, Dansk Metal. Here, he served as the Head of Department for Labour Market Policy, actively advising policymakers based on research within labour economics. He later became the Chief Economist at Dansk Metal, a position he held for four years before joining LO in 2015. Allan Lyngsø Madsen obtained his Master’s degree in Economics from Aarhus University. As part of the preparations for Aarhus Symposium Focus 2016, we conducted an insightful interview with Allan Lyngsø Madsen. As the Chief Economist of the Danish Confederation of Trade Unions, LO, he shared his thoughts on the demographic changes within the Danish economy. programme will, through apprentice wages, introduce new inhabitants in Denmark to the labour market by raising their general qualifications. We must increase the qualifications of these new members of our labour force rather than lowering wages in general in the economy. What is your take on Allan Lyngsø Madsen’s points about the distribution of qualifications within the economy? Do you think Denmark will be able to increase productivity while maintaining the relatively equal distribution of income? Join the panel discussion on how we will work, age, and live on October 31, 2016. During the programme, twenty weeks are devoted specifically to education, an important aspect to Allan Lyngsø Madsen. He notes: “Along with teaching them Danish, some of these people do have an educational background, which we can build on”. To him, there is only one solution to the current situation: “We must increase the qualifications of these new members of our labour force rather than lowering wages in general in the economy,” he concludes. We are excited to welcome Torben Tranæs, Professor and Executive Director of Research at the Danish National Centre for Social Research, SFI, to Aarhus Symposium Focus 2016. Torben Tranæs’s areas of research include labour market relations, migration and integration as well as welfare and income distribution in Denmark. Prior to joining SFI, Torben Tranæs served as the Director of Research at the Rockwool Foundation’s Research Unit from 2003 to 2015. Torben Tranæs’s excellent research and numerous publications have made him a very well-respected voice in economic debates in Denmark and internationally. Today, Torben Tranæs also serves as Co-Chairman in the Danish Economic Council. Torben Tranæs holds a Master’s degree and a Ph.D. in Economics from The University of Copenhagen, where he has also been an Associate Professor for 6 years. for fiscal stability? Immigration is the key issue in the discussion on demographic changes, according to Torben Tranæs, Executive Director of Research at the Danish National Centre for Social Science, SFI. In an interview, Torben Tranæs willingly shared his insights on how we will work, age, and live in the future. Torben Tranæs is quite nuanced in his views on immigration, he does emphasize the fiscal challenges immigration causes: “Of course, it is beneficial that people from Eastern Europe come to Denmark to work. However, it is a problem if Danish residents do not get some of these jobs - from a fiscal point of view”, Torben Tranæs explains. and also making it easier for companies to hire immigrants and refugees. “In principle, facing the immigration problem from both the demand and supply side is the right approach. However, there may still be too many bureaucratic barriers from the firms’ perspective for this to have a large effect,” Torben Tranæs notes. How should we tackle immigration? If the high inflow of immigrants from poorer countries continues, we will see more income inequality in the economy. If these challenges are not addressed, they will have consequences, according to Torben Tranæs: “If the high inflow of immigrants from poorer countries continues, we will see more income inequality in the economy and more welfare dependences. This will potentially mean higher taxes, less social security or less public service, also for people who are higher up the income ladder, so indirectly it is likely that everyone will experience a welfare effect from increased immigration”, Torben Tranæs concludes. Which implications do you believe will result from increased immigration? How ought Danish policymakers solve the challenges of integration? Join the panel discussion on how we will work, age, and live on October 31, 2016. We are pleased to welcome Troels Bjerg, Regional CEO Northern Europe at ISS A/S, to Aarhus Symposium Focus 2016. Troels Bjerg has held various international positions at German Daimler AG before joining ISS in 2009. Today, Troels Bjerg is part of the Executive Group Management at ISS, one of the worldâ&#x20AC;&#x2122;s largest facility service companies, and the Regional CEO of more than 80,000 employees in Northern Europe. Among other positions, Troels Bjerg is a member of the Board of Directors at Ejner Hessel Holding A/S as well as a member of the Central Board at the Confederation of Danish Industry, DI. Troels Bjerg holds a Bachelorâ&#x20AC;&#x2122;s degree in Business Administration from Copenhagen Business School and a Master of Business Administration from IMD Business School in Switzerland. During the preparations for Aarhus Symposium Focus 2016, we asked Troels Bjerg to share his view on the demographic changes in the Danish economy. As the Regional CEO of Northern Europe at ISS, the demographic development in Denmark and the rest of Northern Europe, is of high interest to Troels Bjerg. In an inspiring interview, Troels Bjerg gave his take on how we will work, age, and live in the future. we find language skills to be very important. Language and playing an active part on the labour market are the keys to successful integration”, Troels Bjerg says. Complacency, for any company or economy, is the greatest danger of all. Do you think Troels Bjerg is right when he says low productivity growth is a result of complacency? How do you think the Danish economy can succeed in leveraging labour generated by immigration? Join the panel discussion on how we will work, age, and live on October 31, 2016. Troels Bjerg points out how ISS uses several different approaches in the process of getting more immigrants and refugees into the labour market. The new members of the Danish labour force are not only hired for service jobs as the company also seeks to get more foreigners into management positions. “A number of these people coming into our country are very resourceful and they have quite strong academic skills which they cannot put to use for various reasons. We have management and talent programmes, where we try to build on these competencies, as these people are a very strong source of talent for Denmark and for ISS,” Troels Bjerg concludes. We are excited to welcome back Thomas Bernt Henriksen as the moderator of Aarhus Symposium Focus 2016. Thomas Bernt Henriksen is the Op-ed Editor at Dagbladet Børsen, where he focuses on linking new economic research to the current political agenda. In this way, Thomas Bernt Henriksen combines his education within economics and his research experience with his excellent talent for communications. Thomas Bernt Henriksen has previously served as the Council Director for the European Council of Economists. He joined Børsen in 2002 from a position as First Vice President in Danske Markets at Danske Bank. Thomas Bernt Henriksen holds a Master’s degree in Economics from the University of Copenhagen. Due to his educational background as an economist and his journalistic experience, Thomas Bernt Henriksen will make sure to guide us through the discussion and presentations of Aarhus Symposium Focus 2016 in an enlightening way. We are looking forward to Thomas Bernt Henriksen’s participation on October 31, 2016.